"WARNING! 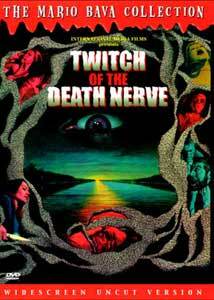 Are you aware that Twitch Of The Death Nerve contains scenes that may be the stimulus to psychological shock? WARNING! During scenes of intense shock, do not attempt to leave your seat. If neccesary, close your eyes, but remain seated until you have regained your composure." Mario Bava's movies have certainly made quite an impact on films in general, especially in the genre of horror. It's hard to disagree, though, that his 1971 film Twitch of the Death Nerve (known by dozens of other titles) is possibly his greatest gift to modern cinema, or his greatest curse depending on your point of view. Twitch is largely considered to be the great-grandfather of the standard 'slasher' formula, where a number of gory killings are performed (usually in some isolated locale) by some unknown stalker. Bava, with all his subtle genius, has the distinction of creating one of the most unique plots for this kind of movie; a story so outlandish and complex, you might need a flowchart to work it out. As the story begins, an older woman (the Countess) is strangled to death. Her killer is soon revealed to the audience as none other than her husband, who is staging the murder to look like a suicide. But he is then quickly dispatched by another, mysterious killer. As the film progresses, we learn that the Countess was a resident of a bayside community, filled with some very colorful, unusual characters. Although there are whisperings about the Countess having been murdered, no one really discusses the issue much. A group of partying kids shows up at the bay, and the body count multiplies as the mysterious killer starts hacking away at the residents of the community. Things get more complex when the Countess' daughter, Renata (Claudine Auger, most remembered as 'Domino' in the Bond film Thunderball), shows up, trying to manipulate the size of her inheritance. While the story is a bit hard to follow (especially with all the flashbacks later in the film), the general idea should be pretty clear. Someone is killing people off, possibly motivated by the greed to take over ownership of the bay. Bava, known to have a good sense of humor, puts a mean-streak of black comedy into this movie, though, by placing many plot twists into the mix. Whether or not he meant this to be intentionally funny, I'm not too sure; but it adds a sinister turn to an otherwise average plot. The idea behind Twitch is savagely sick and twisted, especially when cramming so much carnage into an hour-and-a-half, but that's where the spark lies. For the era, Twitch is a pretty daring move in the horror genre, especially as it is so relentlessly violent. It isn't quite as gory as the hype might lead one to believe, but there are a total of 13 deaths, which is pretty high even when compared to other, better-known gore flicks. As many people have pointed out over time, much of this movie has been badly imitated (or just plain ripped-off) in many American works, most notably the Friday The 13th films. Ironically, Mario Bava had to contend with a ridiculously low budget (including running out of funds before finishing), but still managed to make a horror piece that outdoes virtually all of its direct imitators. Anyone who likes these kinds of movies will find Twitch of the Death Nerve inescapably absorbing, and leaps and bounds above similar titles. Image Transfer Review: Although the early moments of the film are pretty awful (overly dark, heavily damaged), after a few minutes the image settles into an impressive, nicely rendered look. Colors look rich and well-balanced, and black level is very sharp and accurate. Age has taken an obvious toll here; there are many speckles, holes, scratches, and other source flaws. None of these things detract from the film, though, which looks pretty impressive given the age and general condition. Other than the problematic opening moments, I perceived no signs of compression artifacts or pixel shimmer, even in muddier scenes. The anamorphic enhancement seems to have added a certain amount of improvement without exaggerating any of the source flaws, and I can't imagine this looking bad on a widescreen set. Audio Transfer Review: The film has obvious source damage and the sound seems to have taken the brunt of it. The single-channel mono mix is extremely harsh, distorted and flat sounding. Most dialogue is virtually impossible to understand at normal levels, so I had to increase the volume a lot; then, the louder portions suddenly blast out of the speakers, especially the musical score. There seems to be almost no middle ground; the film is either too quiet or too loud. This is an annoying problem, but doesn't really effect enjoyment of the film too much. Extras Review: The most significant feature on the disc is the "Murder Menu," which is simply an alternate chapter listing for the movie that specifically accesses the 13 murder sequences in the film. The photo gallery is a series of promotional stills and poster images from the film, some of which are from different countries. Unfortunately, the gallery is played in real-time, and you cannot pause it, causing obvious problems. The film's U.S. trailer (where the film was called Carnage) is presented, as are trailers for 6 other Mario Bava films in the Image "Bava Collection" series. There are also 2 U.S. radio ads presented. The gatefold cover of the case contains an essay about Twitch written by Tim Lucas of Video Watchdog magazine, who also contributes a lengthy biography of Mario Bava to the disc's filmography section. Twitch of the Death Nerve is an extremely entertaining disc, and Image's treatment of the film adds new respect to this revolutionary entry in the world of the horror genre. It's too bad Mario Bava never lived to see his films become so influential, but at least we can appreciate them with these great presentations. Highly recommended.